Charles Sanford Hinshaw1,10 [Sanford Hinshaw6,8,11,12,13,14,15, Sandford Hinshaw16]. Born Jan 2 18411,2,4,5,6,10,11,12,15,16,17, Warren County, Indiana1,2,4,5,6,10,11,12,15,16,17 [Missouri3]. He married Elma Caroline Childers1,5,11,16 [Elma Carline Childers8], Sep 15 18781,5,11,16, Dallas, Polk County, Oregon1,5,11,16. Elma, daughter of Robert Childers & Mary Walling1,3,17, was born Jan 1 18621,3,17 [about 18512, about 18614,6], probably Yamhill County, Oregon1,3,17. 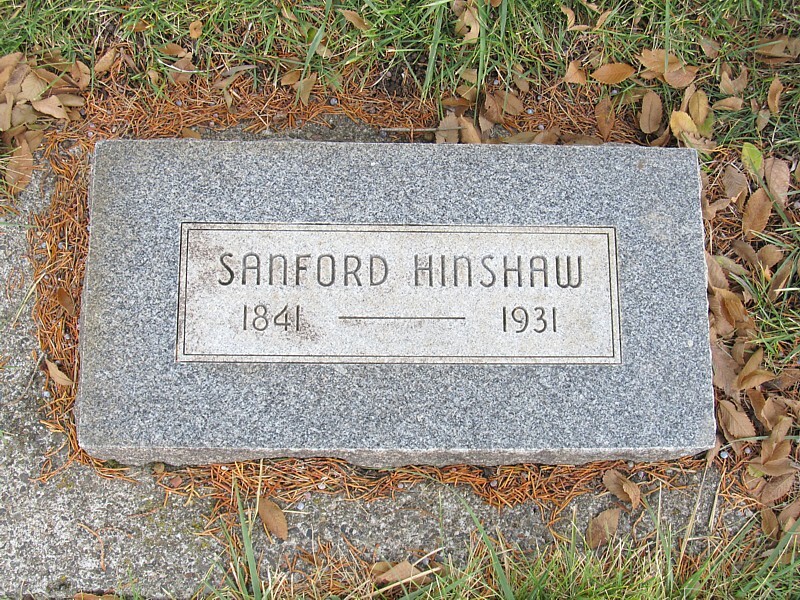 Hinshaw, Sanford, age 39, born in Indiana; father born in Ohio; mother born in Indiana; farmer. Hinshaw, Elma, wife, age 29, born in Oregon; father's birthplace unspecified; mother born in Ireland; keeping house. Hinshaw, Isaac, son, age 9 months, born in Oregon; father born in Indiana; mother born in Oregon. Hinshaw, William, uncle, age 57, born in Ohio; father born in North Carolina; mother born in Tennessee; widower; farmer. Hinshaw, Joseph C., cousin, age 17, born in Iowa; father born in Ohio; mother born in Missouri; attended school. 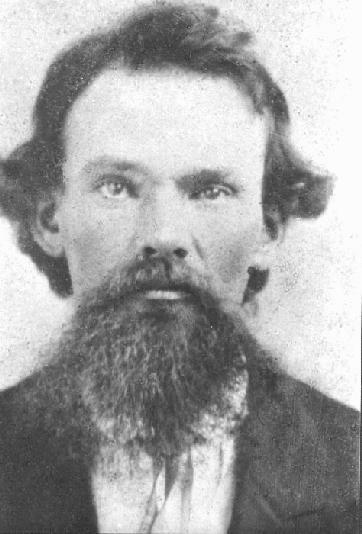 Hinshaw, George W., cousin, age 15, born in Kansas; father born in Ohio; mother born in Missouri; attended school. Stanley, Catherine, aunt, age 73, born in Ohio; father's birthplace unspecified; mother born in Tennessee; widow. Hinshaw, S., head-of-household, age 59, born Jan 1841 in Missouri; parents born in Missouri; married 22 years; occupation: farmer; owned farm (free). Hinshaw, E.C., wife, age 38, born Jan 1862 in Oregon; father born in Germany; mother born in Ireland; married 22 years; 5 children, 5 living. Hinshaw, I., son, age 20, born Aug 1879 in Oregon; father born in Missouri; mother born in Oregon; occupation: day laborer. Hinshaw, E., daughter, age 13, born April 1887 in Oregon; father born in Missouri; mother born in Oregon. Hinshaw, O., son, age 6, born March 1894 in Oregon; father born in Missouri; mother born in Oregon. Hinshaw, Sanford, head-of-household, age 69, born in Indiana; parents born in United States; first marriage, married 31 years; occupation: farmer, general farm; rented home. Hinshaw, Elma C., wife, age 49, born in Oregon; father born in Germany; mother born in Ireland; keeping house; first marriage, married 31 years; 6 children, 4 living. Hinshaw, Albert O., son, age 16, born in Oregon; father born in Indiana; mother born in Oregon; attended school. Goodwin, William M., son-in-law, age 32, born in Texas; father born in United States; mother born in Oregon; widower; occupation: teamster, freight teams. Goodwin, Alta L. [middle initial unclear], granddaughter, age 10, born in Oregon; father born in Texas; mother born in Oregon; attended school. Goodwin, William J., grandson, age 8, born in Oregon; father born in Texas; mother born in Oregon; attended school. Goodwin, Ada M., granddaughter, age 7, born in Oregon; father born in Texas; mother born in Oregon; attended school. Goodwin, Rita L., granddaughter, age 4, born in Oregon; father born in Texas; mother born in Oregon. Hinshaw, Isaac, son, age 50, born in Oregon; father born in Indiana; mother born in Oregon; widow; occupation: laborer, forest services; not a veteran. Hinshaw, Charles, grandson, age 22, born in Oregon; parents born in Oregon; occupation: laborer, farm; not a veteran. Charles Sanford Hinshaw died Oct 16 193125,26 [Oct 15 193112,27, Oct 15 19321, 193328], Mt. Vernon, Grant County, Oregon25,26; buried Canyon City Cemetery, Canyon City, Grant County, Oregon25,26. Elma died May 31 19365,14,26 [May 13 19361,28], Mt. Vernon, Grant County, Oregon5,14,26; buried Canyon City Cemetery, Canyon City, Grant County, Oregon5,14,26. 1880 census, Douglas Precinct, Polk County, Oregon; roll T9-1083, ED 103, page 454A, line #16, dwelling #103, family #104. 1900 census, Waldron Precinct, Wheeler County, Oregon; roll T623-1353, ED 153, page 2A, line #1, dwelling #24, family #26. 1900 census, Waldron Precinct, Wheeler County, Oregon; roll T623-1353, ED 153, page 1B, line #94, dwelling #22, family #24. 1920 census, Middle Precinct, Grant County, Oregon; roll T625-1494, ED 59, page 2A, line #34, dwelling #29, family #29. 1920 census, Middle Precinct, Grant County, Oregon; roll T625-1494, ED 59, page 2A, line #21, dwelling #27, family #27. 1920 census, Middle Precinct, Grant County, Oregon; roll T625-1494, ED 59, page 2A, line #11, dwelling #26, family #26. "Brazen Overlanders of 1845", page 434.